New York City, at one time or another, has had three settlements named Richmond Hill. The one in Manhattan, in what is now the west Village, and the one in Staten Island, in what is now Richmondtown, have pretty much been absorbed into new neighborhoods. Queens’ Richmond Hill has been more enduring. In 1869, developers Albon Platt Man and Edward Richmond laid out a new community just west of Jamaica with a post office and railroad station, and Richmond named the area for himself (or, perhaps, a London suburb, Richmond-On-Thames, a favorite royal stomping ground). 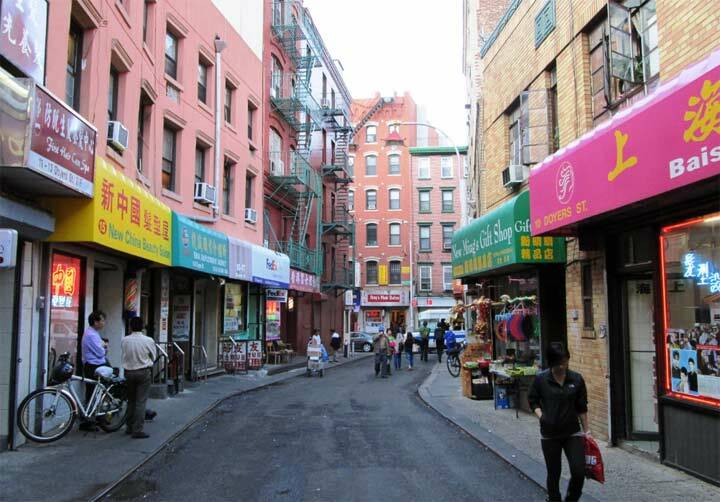 It became a self-contained community of Queen Anne architecture west of Van Wyck Boulevard (now Expressway) that remains fairly intact to the present day. Journalist/activist Jacob Riis as well as the Marx Brothers were Richmond Hill residents in the early 20th Century. 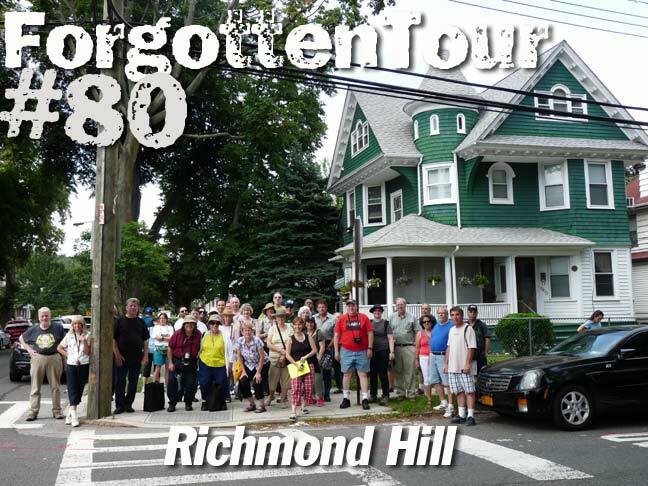 On Saturday, June 28, 2014, nearly 50 ForgottenFans, augmented by members of the Richmond Hill and Woodhaven Historical Societies, paid a visit to this anachronistic Queens neighborhood. We visited not only some of the beautiful Victorian architecture, but also a venerable building once frequented by US Presidents; a pipe factory converted to residential housing; and best of all, were given a guided tour of the Church of the Resurrection, where Teddy Roosevelt visited and Jacob Riis was a parishioner. Photos from Tour #80, Richmond Hill, all by Bob Mulero and Joe DeMarco. RICHMOND HILL QUEENS IS A GREAT TOWN!! I GREW UP ON 108 ST, ABOUT ONE BLOCK FROM FOREST PARK. ALWAYS HAD GREAT TIMES AS A KID GROWING UP THERE. ALTHOUGH IT HAS CHANGED A LOT, IT IS STILL PRETTY SAFE THERE. WENT TO PS 90 AS A KID & RICHMOND HILL HIGH SCHOOL. TONS OF GREAT LOOKING OLD HOUSES IN RICHMOND HILL, I HEARD MORE HERE THAN ANY WHERE ELSE IN THE CITY. ONLY BAD THING IS THAT THERE ARE NOT MANY GOOD RESTAURANTS HERE, WE HAD CONNIES WHEN I WAS A KID ON JAMAICA AVE, IT WAS AN ITALIAN RESTAURANT/PIZZARIA. THERE ARE NUMEROUS GOOD DINERS BUT REALLY NO GOOD RESTAURANTS TO SPEAK OF. I REALLY WISH JAHNS NEVER CLOSED!! NOT THE GREATEST PLACE, BUT SOMETHING ALWAYS MADE ME GO BACK. ALWAYS ORDERED A BACON CHEESEBURGER DELUX FOLLOWED BY A REESES PEANUT BUTTER CUP SUNDAE. LOVED THEM BOTH!! HEARD THERE IS A JAHNS IN JACKSON HEIGHTS, HAVE TO GO THERE WITH MY WIFE ONE AFTERNOON OR NITE TO CHECK IT OUT AND COMPARE THAT ONE AGAINST THE ONE THAT WAS IN RICHMOND HILL, PROBABLY THE SAME.